If you love dumplings, you'll want to try this recipe filled with ground chicken, blue cheese and spices with a buffalo style hot sauce for dipping! In a medium bowl mix first 9 ingredients together by hand until evenly combined. Assemble dumplings by placing wonton wrapper on a flat surface. Roll a small ball of the chicken mixture between your hands, about a tablespoon, and place in the center of the wonton wrapper. Dip a finger in a cup of water and run it around the edges of the wrapper. Pick up wrapper and chicken ball with one hand (between your thumb and index finger) and begin pinching hard around the wrapper until it tightly wraps the chicken ball. Re-pinch if necessary. Your dumplings should be star-shaped with the chicken ball in the center. 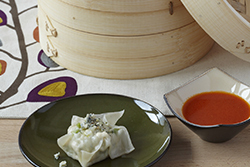 Spray your IMUSA steaming basket with non-stick spray and place dumplings throughout. Steam for 10 minutes until fully cooked. In the meantime make hot sauce by gently heating it with the butter. Spoon some hot sauce on a plate and place dumplings on top. Garnish with more crumbled blue cheese, if desired. A great way to use leftover rice! 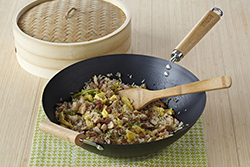 Mixing with chicken, ham, eggs, and vegetables creates a complete Asian-Inspired meal! 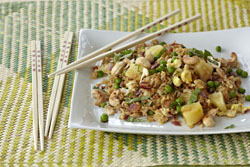 This recipe comes with an additional recipe for Shrimp Sauce - that is a perfect topping to the fried rice! add the beaten egg until lightly scrambled followed by the chicken and ham. Add the rice breaking up with an IMUSA wooden Asian spatula and continue stirring until all the ingredients are well combined and the rice is very hot. Add the soy sauce all over the rice while stirring quickly. Serve with shrimp sauce on the side: Combine all ingredients in a bowl and whisk until very smooth. Serve with fried rice. Combine cucumber, sprouts, carrots, scallions, basil, mint and sesame with a generous sprinkle of sugar and rice wine vinegar. Add salt to taste. Using an IMUSA whisk, combine peanut butter, soy sauce, vinegar and cayenne and oil. Set aside. 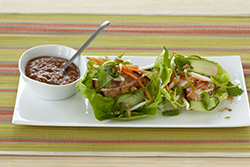 Fill the lettuce leaves with equal amounts of the veggie chicken mix, top with peanut sauce, roll up and enjoy. You will never order Chinese Takeout again! This delicious recipe has a touch of sweetness with pineapple chunks and additional crunch from roasted cashews! Combine sugar and soy sauce and set aside. Heat your IMUSA wok on high heat and add 2 tablespoons oil to wok, then tilt the wok to swirl oil, coating the sides. Once the oil begins to smoke, stir-fry the garlic and red onions for one minute and set aside in a bowl. Add 4 more tablespoons of oil and crumble rice into wok. Stir-fry for 5 minutes with a flat wooden spatula until lightly browned, breaking up lumps of rice. Push rice to the side of wok and in the center add another tablespoon of oil. Add scrambled eggs and scramble until eggs are completely cooked and crumbled. Mix together with rice and add cooked garlic and onions. Drizzle in soy sauce mixture and stir-fry for two more minutes. Add pineapple, peas, and cashews and mix evenly. Remove from heat and mix in chopped basil. Garnish with extra basil before serving.